Track days! They’re about bringing your own car, driving as fast as you dare in a circle, shredding your newly bought track tires, and heading home at the end of the day feeling like a professional race car driver. It’s the most fun anyone could have in their car. But therein lies a problem; there’s not very many sport cars on the market that are track purpose built. Most sports cars are designed for the gentleman in mid-life crisis mode. That is, until Toyota joined forces with Subaru and launched perhaps one of the best small sport cars on the market. Since this is a proper track car, we rang up Toyota and asked them if we could put this Scion FR-S in its proper element. They were inclined to agree… so we took it the Bondurant Race Track in Chandler, Arizona to find out for ourselves what it’s capable of. Upon arrival, we couldn’t help but get drawn into the FR-S’s $395 optional ‘Whiteout’ specialty paint. The FR-S articulates a very attractive sport design that many keen enthusiast’s desire. The rigid front fascia speaks volume… saying it’s not to be messed with. Add the 17” alloy wheels with black inserts into the mix and the overall appearance is greatly enriched. There are only two true options for the FR-S: Manual or Automatic. Luckily for us, Scion only had a manual transmission for us to test. The FR-S uses a 2.0L flat 4-cylinder boxer engine from Subaru that emits 200hp and 151lb-ft of torque. Like a proper sports car, power is delivered to the rear wheels – all you need is roughly 6 seconds to 60mph and a long enough stretch of road to reach its top speed of 143mph. On the track, the FR-S is superbly fantastic. With our 6-speed manual transmission, shifting between gears were short & quick offering an enthusiastic response. Our track was full of twists and turns which meant we were generally left driving in 2nd and 3rd gear most of the time. When it came to acceleration the 151lb-ft of torque was decent, but didn’t give us the edge we were looking for against the other drivers. Between 2,500 and 4,500 rpm, the FR-S lag in its acceleration – once it reached 5,000rpm the boxer engine opened up, revving towards 7,400rpm; then the rev limiter would flash indicating time to shift. 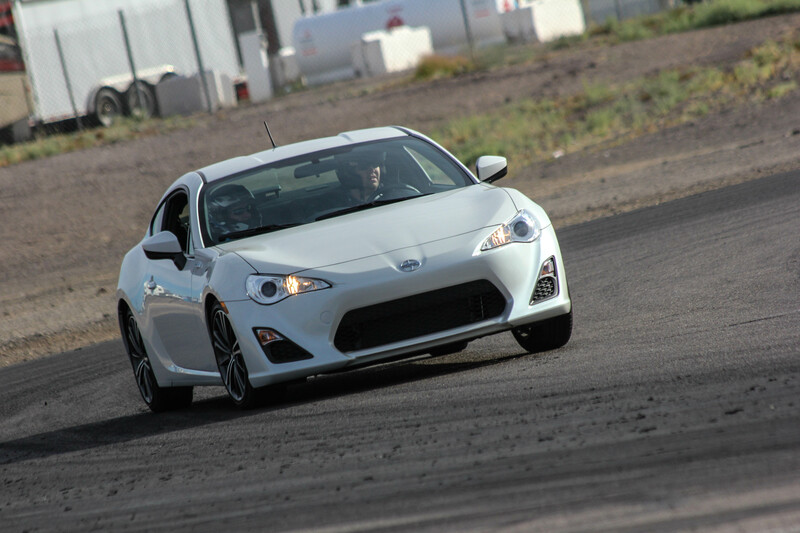 The limited slip differential really showed it excellence in maintaining an equal balance of torque delivery… which leads to the FR-S’s party piece: VSC Mode. We like to call it ‘Vicious Mode’; once engaged, it turns a portion of the traction control off – allowing the driver to attack the corners more courageously. Because the Scion FR-S’s uses skinny Bridgestone tires; like the ones found on the higher end Toyota Prius; there’s no grip which means you can get the FR-S to slide around the corners. And that’s where the VSC Mode starts to work. It’s not hard to get the FR-S into a slide, getting it out is another story. A good driver will know how what they’re doing, but the VSC Mode helps control the inexperienced drivers from looking amateur. Once the FR-S senses the loss of control and starts to slip, VSC Mode kicks in and straightens it back out. There is a dramatic loss in power, but well worth not crashing into the tire wall. The type of track we were on demanded intensive steering precision and a solid chassis. Because most of the work was done by Subaru, it shows. The electric steering is brilliant – extremely precise and responsive to the hard cornering. The double wishbone rear suspension is firm which made cornering solid providing very little body roll. Now, we’ve been on the track a couple of times and haven’t experienced something this good. Because of the fantastic steering system, firm suspension and nearly 50/50 weight distribution clipping an apex was never missed. So the FR-S proved its worthiness on a track; what about every-day driving conditions? Well… the Scion works in that world too. The FR-S is easy to drive; it has a simple gearbox, its fuel efficient at 30mpg, and it’s a comfortable place to sit in. Our FR-S came with a black and red interior, which was surprisingly comfortable. The racing designed seats kept the driver and passenger supported for a snug fit. There is a back seat, but it’s kind of a running joke – not even a child could fit. The leather wrapped steering wheel is thick and feels good in the hands; you won’t find mounted audio controls which make it less of a distraction. For the size of the FR-S, the interior cabin doesn’t feel enclosed – there’s room to move and even headroom room for when you have a helmet on. New for 2014, the FR-S comes standard with the 6.1” Pioneer Touch Screen Display. It comes off a bit aftermarket-ish, but it works well against the impressionable carbon fiber trim and silver accents. Bluetooth Connectivity and HD Radio are notable features, but no satellite radio. On the city roads, the steering doesn’t feel heavy or stiff – which makes it great at low speeds and parking. Surprisingly, it has a fantastic turning ratio. However, there are quite a few drawbacks to the FR-S that makes it hard to live with on an everyday basis. Getting in and out gets a bit tiring, the ride is very bouncy on rough roads, there are massive blind spots, the interior cabin rattles, and there’s no interior storage. But for that one time a month when you hit the track, all is forgiven and forgotten – nothing else matters and for under $26,000, you can’t get a more fun car then this for less money.